Emphysema is part of the larger complex called chronic obstructive pulmonary disease (COPD). It is a respiratory disease where the air sacs of the lungs have been enlarged, damaged, and restricted. The alveoli at the end of the lung bronchioles become enlarged due to the breakdown of their walls. The damaged air sacs is permanent, and results in difficulty of the most important thing in life—breathing. Homeopathy can provide a safe treatment option for people with COPD and emphysema. Over 11 million people in the U.S. have been diagnosed with COPD, and 4 million of that have emphysema. However, an estimated 24 million may have COPD without knowing it. COPD also includes chronic bronchitis, and in some cases, asthma. Emphysema is often the direct result of years of cigarette smoking, and it affects the middle-aged or elderly. On the other hand, chronic bronchitis can occur earlier in life, and is also caused from smoking. Symptoms of COPD and emphysema often don’t appear until significant lung damage has occurred. The symptoms will also begin mildly and will also worsen if the person continues to smoke. Here are some of the symptoms to look out for. In advanced stages of emphysema, the person may also experience frequent lung infections, depression and anxiety, sleep problems, morning headaches, unintended weight loss, production of a lot of mucus, and blueness of the lips or fingernail beds. Long-term cigarette smoking is by far the biggest risk factor of COPD and emphysema. The chemicals contained in a cigarette will slowly destroy the small peripheral airways in the lungs, which results in emphysema. The more years you smoke and the more cigarettes you smoke daily will increase your risk of developing the condition. People that smoke marijuana, cigars, and pipes are also at risk. You are also at risk if exposed to large amounts of secondhand smoke. Having asthma and smoking will increase your emphysema even more. Long-term exposure to vapors, dusts, and chemical fumes in the workplace and elsewhere can also irritate your lungs. Alpha-1 antitrypsin deficiency is also a known genetic cause of COPD. The alpha-1 antitrypsin protein is necessary for protecting lungs against neutrophil elastase destruction of alveolar tissue. Although damage to the lungs caused from emphysema is not reversible, emphysema is a treatable condition. If left untreated, emphysema can also increase the severity of other conditions like heart failure and diabetes. Common pharmaceutical treatments include bronchodilators, inhaled steroids, and even antibiotics to control infections. Oxygen therapy and lung reduction surgery may also be needed. Homeopathy also plays a vital role in clearing mucus, healing inflammation, and improving breathing, while also strengthening the immune system. An observational study published in the journal Multidisciplinary Respiratory Medicine in 2016 suggested that homeopathic medicine may have a positive effect in preventing respiratory tract infections like COPD and emphysema. The study examined 459 patients, and 248 were treated with homeopathy from 2002 to 2011. For emphysema, homeopathic remedies are used in lower potencies of 6x, 12x, 6c, or 12c, for two to three times daily for several weeks at a time, with breaks in between. Symptom relief and gradual improvement will occur. The following are the six most used emphysema homeopathic remedies. Ammonium carbonicum should be used in those that are frequently weak on a physical level. They may also cough often, and suffer from blockages in the nose, palpitations, shortness of breath, and burning sensations in the chest. Drowsiness, yawning, and nosebleeds are also common. Lying on the stomach improves symptoms, while symptoms worsen at night and from dampness and cold temperatures. Antimonium tartaricum is necessary for patients with suffocating sensations, along with a weak pulse, and coughing episodes that suddenly end with vomiting. The person also feels exhaustion easily, and they are unable to perform any type of physical activity. Other symptoms include yawning, nausea, drowsiness, sweating, and irritability. Symptoms may improve by lying on the right side or after expectorating. Movement, eating, drinking, and being in a warm room may worsen symptoms. Carbo vegetabilis is used for people with frequent wheezing episodes. The person may also be physically exhausted quite often. They also have a dusky or bluish complexion, and a burning sensation in the chest. Other symptoms include a coarse cough, cold breath, shortness of breath, coking on phlegm, sweating, and offensive gas. Belching and cool air improve symptoms, while rich food, warmth, and open air will make things worse. Persistent shortness of breath is common in those that require arsenicum. The person also has a somewhat blue complexion, while being covered in cold sweat. Symptoms also seem to get worsen when the patient lies down. Other symptoms include shortness of breath, wheezing and whistling respiration, and burning sensations despite being chilly. The person also is restless and has a fear of death. Coffee, heat, and sitting upright seem to improve symptoms. On the other hand, laughing, being outdoors, cold temperatures, coughing, and alcohol will make things worse. The person that improves with grindelia will suffocate upon going to sleep or waking. They will experience difficulty breathing, shortness of breath, panting, and wheezing. Expectoration of yellow-green or whitish mucus is also common. Itching skin rashes, pain in eyeballs, and a weak, dilated heart are also symptoms. Things improve from expelling mucus; however, they worsen from excitement, waking, lying down, or cold weather. Sulphuricum acidum is required for emphysema with a hacking cough, wheezing, rattling breaths, and the feeling of suffocation. A blue-greyish face and expectoration of dirty gray, or blood-stained mucus is also common. The person will also experience sneezing, and an irritation or burning in the nose, throat, and larynx. From an emotional perspective, the person is often anxious, combative, and angry. Natural anti-inflammatories, lung-protecting agents, and antioxidants work to slow the progression of emphysema. Another surefire way to prevent and treat emphysema is to quit smoking and avoid smoke in any way. This also includes using electronic cigarettes. Improving your breathing can also increase your blood oxygen levels, and decrease shortness of breath. A respiratory therapist can also help with breathing techniques. The following are a few other specific natural emphysema remedies that help for better breathing. Cold air can trigger a sudden constriction in the muscles of airway walls, which can lead to shortness of breath. That is why it is smart to reduce or avoid time outdoors. You will help your symptoms with a face mask when going outside in cold temperatures. Also, the less time spend in big crowds will reduce your risk of being exposed to infectious germs, and this can worsen your symptoms. The supplement NAC (N-Acetylcysteine) will help decrease the severity and frequency of asthma attacks, while improving overall lung function. It does this by thinning bronchial mucus and increasing glutathione levels. Glutathione fights oxidative stress in the respiratory tract. A study published in the Respiratory Research journal in 2009 found that the main constituent of eucalyptus essential oil called cineole, reduces COPD exacerbations and shortness of breath, while also improving lung function. Eucalyptus oil is best to use in a diffuser or humidifier. Studies have found that Panax ginseng and its active compounds called ginsenosides will inhibit processes linked to COPD development. Ginseng improves lung function and reduces lung bacteria, and has a long history in traditional Chinese medicine in treating COPD. Emphysema can be a debilitating condition; however, it is treatable. Also, following a healthy diet with fresh fruit and vegetables can ensure that you are getting plenty of antioxidants like quercetin. Stay away from processed, canned, sugary, and frozen foods, which all contribute to breathing issues. Increasing your water intake to at least eight glasses daily can also help you clear mucus that collects in your airways. Regular exercise, especially cardio workouts, will strengthen your respiratory muscles, improve your mood, and reduce depression. This makes it easier to quit smoking! Hershoff, A., N.D., Homeopathic Remedies: A Quick and Easy Guide to Common Disorders and Their Homeopathic Treatments (New York: Penguin Putnam Inc., 1999), 156-157. “Homeopathic Remedy for Emphysema,” SteadyHealth; http://ic.steadyhealth.com/homeopathic-remedy-for-emphysema, last accessed February 8, 2017. “Heitz, D., “COPD vs. Emphysema: Is There a Difference?” Healthline; http://www.healthline.com/health/copd-vs-emphysema#Overview1, medically reviewed October 31, 2016. “Emphysema,” eMedicineHealth; http://www.emedicinehealth.com/emphysema/article_em.htm, last accessed February 8, 2017. 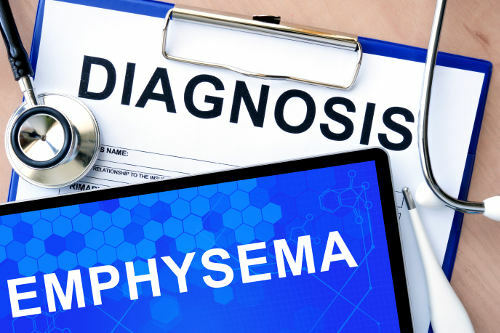 MacGill, M., “Emphysema: Causes, Symptoms and Treatments,” Medical News Today, July 22, 2015; http://www.medicalnewstoday.com/articles/8934.php. Beghi, G.M., et al., “Does homeopathic medicine have a preventative effect on respiratory tract infections? A real life observational study,” Multidisciplinary Respiratory Medicine, 2016; 11: 12, doi: 10.1186/s40248-016-0049-0. Worth, H., et al., “Concomitant therapy with Cineole (Eucalyptole) reduces exacerbations in COPD: A placebo-controlled double-blind trial,” Respiratory Research, 2009, 10:69, 10.101186/1465-9921-10-69.